Theresa May’s desperate gamble in offering up her premiership to win support for her Brexit deal looks to have failed. The U.K. Parliament showed last night that it’s still deadlocked over a solution. 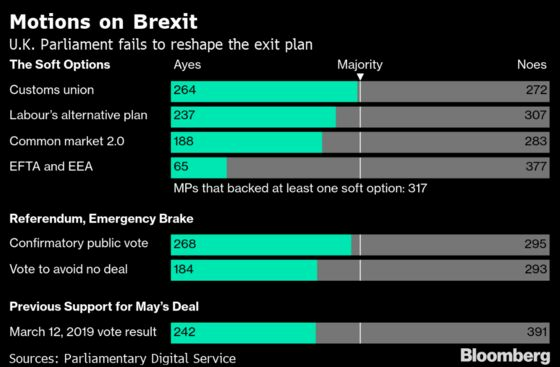 May probably has three choices: seek a long extension to the U.K.’s European Union membership, nearly three years after voters said they wanted out. That will look like a colossal loss and raise the prospect of Brexit being called off. She can call an election to try to change the parliamentary math in her favor. Or she can go back on her word to lawmakers and pursue a no-deal exit on April 12 that would send shockwaves through the British economy and further undercut the Conservatives’ reputation as the party of business and economic competence. May must decide today if she wants to give her deal one last shot. If she fails, Parliament will try again on Monday to find a majority for a divorce it can live with. But the Conservative rank and file are even more bitterly divided than Parliament, so a grubby compromise the House of Commons can endorse could still shatter May’s party. Having offered to sacrifice her own career, she may now face a choice between putting party or country first. Taxing import | Democratic presidential hopefuls are looking to Europe as they explore new ways to tax the rich. There’s just one problem. The most straightforward idea – an annual tax on household wealth – has fallen out of favor. Of 15 European countries that tried a tax, only four still employ it. Most were underwhelmed by the revenue it raised and put off by the difficulty in making accurate collections, Laura Davison reports. Widening gulf | The U.S. and China might be nearing a trade deal, but Washington's increasing assertiveness in challenging Beijing’s geopolitical red lines underscore a strategic rivalry that could outlast any agreement. In recent days, U.S. defiance of China’s warnings against meddling in “internal affairs” included sailing a ship through the Taiwan Strait and hosting Uighur exiles at the State Department. Treasury Secretary Steven Mnuchin and trade czar Robert Lighthizer arrived in Beijing for talks today. German clouds | After a historic run of growth, Chancellor Angela Merkel’s government senses trouble brewing for the German economy, but voters don’t see the storm clouds. That’s creating a conundrum for officials on how to head off risks without sapping further momentum. Bracing for a worst case, the government is prepared to pass recession-busting measures ranging from tax cuts to investment incentives, as Birgit Jennen exclusively reports. Boeing burden | Questions about whether acting U.S. Defense Secretary Pat Shanahan showed favoritism toward his former employer – embattled plane maker Boeing – are complicating his prospects to head the Pentagon. A key Republican senator says President Donald Trump, who’s held off on tapping Shanahan, may not nominate him at all. Not laughing | Frustration at broken promises from the 2014 revolution is the dominant mood for many Ukrainians ahead of Sunday’s presidential elections. Polls show Volodymyr Zelenskiy, a television comic with no political experience, leading the incumbent Petro Poroshenko and former Prime Minister Yulia Tymoshenko. Amid a sense the West is losing interest, there is widespread anger at a failure to end corruption, while living standards are falling and a war with Russia-backed separatists rumbles on. Trump will continue his post-Mueller report victory lap today when he holds his first political rally since the special counsel submitted his final report. After overseeing one of the biggest population shifts to urban areas in modern Turkish history, President Recep Tayyip Erdogan faces a coordinated opposition campaign to weaken his Justice and Development Party’s grip in municipal elections on Sunday. Thailand’s pro-military party won the most votes in Sunday’s election, authorities have confirmed, bolstering its claim to legitimacy as it competes with an anti-junta alliance to form a government. 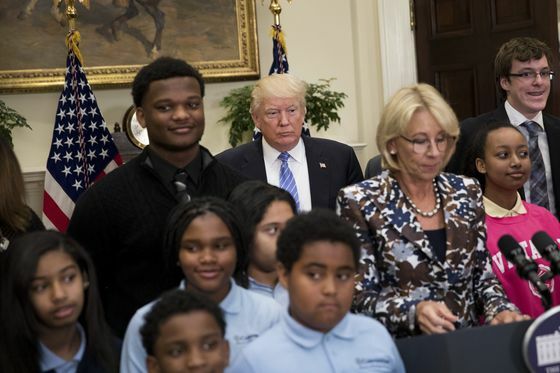 And finally...U.S. Education Secretary Betsy DeVos enhanced her reputation as a villain of the left over her proposal to eliminate funding for the Special Olympics. Athletes, celebrities and politicians of both parties are rallying to support the organization founded in 1968 by Eunice Kennedy Shriver, sister of the late President John F. Kennedy. DeVos gained notoriety at her confirmation hearing by saying some schools may need guns to keep grizzly bears at bay.